The siphon G restoration is progressing. This is the good restored bit. In the left foreground is one of the racks removed from the good end, underneath another rack which is still in position. It is acting as ballast for a plastic table which is filling the hole where a door was removed. The door next to it is finished except for painting and some metal fittings. Beyond that are some panels off the removed door and various other things to screen off the area below the restored louvres. The end of the carriage needs some more horizontal panels at the bottom. Wood has arrived for these vacant areas and has been cut to length, painted with two coats of primer/undercoat and are ready to be fitted - then no bodywork gaps - hooray its cold in here at present. This is standing back from picture 1 and shows the condition of most of the internal paintwork. Luckily we will be replacing the side panelling of the carriage. The louvres above the panelling will be cleaned up and rejuvenated with linseed oil before repainting. This picture is taken from about the same position as picture 2 but looking the other way. More racks to restore! Note the ceiling which is very flaky now but hopefully will clean up. In the middle foreground is our only means of warmth. This is a workbench we made. On it, on blocks, is the removed door with panels off and the bottom member removed. The lump of hardwood perched on the door is marked up ready for cutting to make a new bottom. Note the GWR transfers for the sides when we finish them. 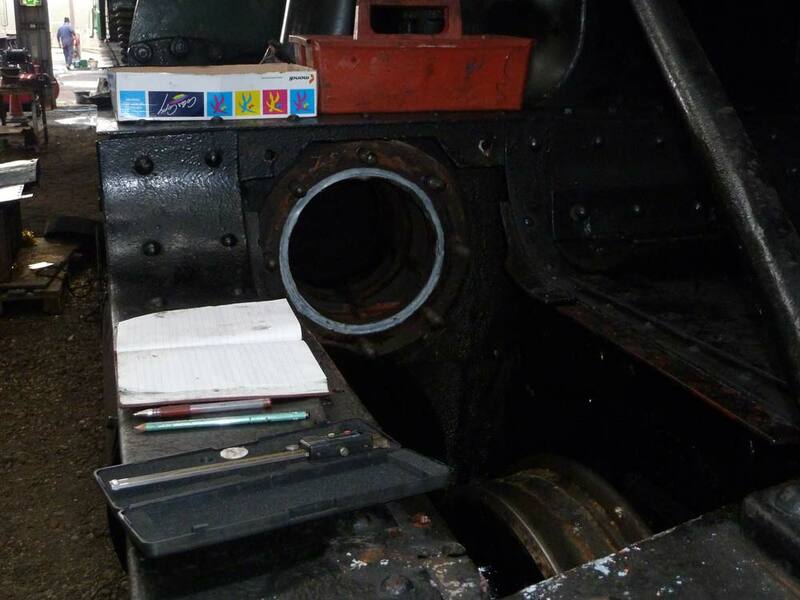 The old bottom piece is on the foreground together with one painted horizontal panel for the carriage end. The locomotive is now out of service for winter maintenance. Here No. 2807 is seen inside the shed at Toddington. On Friday 4th January, the safety valves were tested and the springs removed. 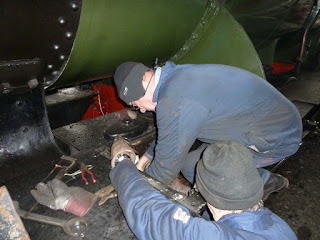 On Saturday, the valve spindles were removed. This requires removal of some of the running plates, and then disconnection of the operating rods. This has to be carried out in a confined space, as is often the case. 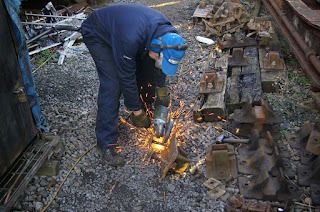 The photo shows the left hand side being dismantled. 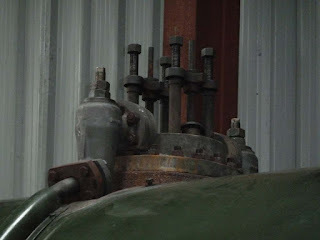 Then the valve cylinder front cover has to be removed and the valve spindle extracted from the front. 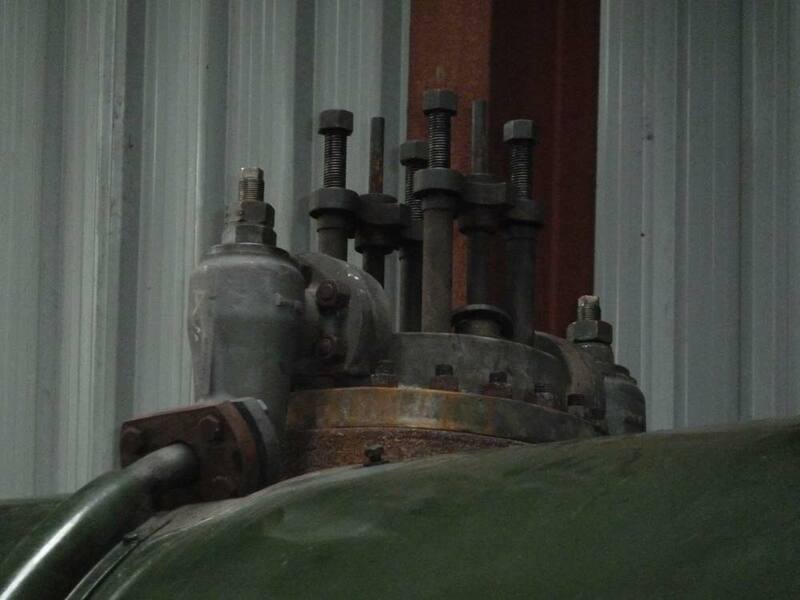 The photo shows the right hand side valve cylinder with the front cover removed. 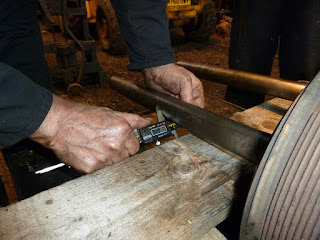 The valve spindles were then measured to check for wear. 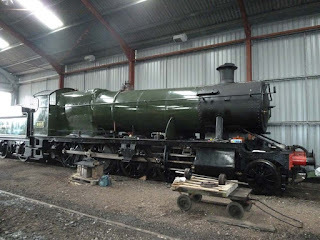 The total number of steaming days for 2012 was 65, with a total mileage of 3609 miles.